I just love eggless cake and Vanilla is my favorite flavor.My baker buddy Lakshmi always sings praises about this cake(Nita mehta’s recipe) and I finally baked it today .I found this recipe in Divya’s blog .The cake came out pretty soft and was super good to taste.Icing always enhances the beauty of the cake and I decked the cake with the store bought vanilla icing and it was looking like a white bride..But I gave a thin layer of icing since none of us here have a sweet tooth.Personally even I like mild sweetish cake.This recipe is very simple and easy to bake. 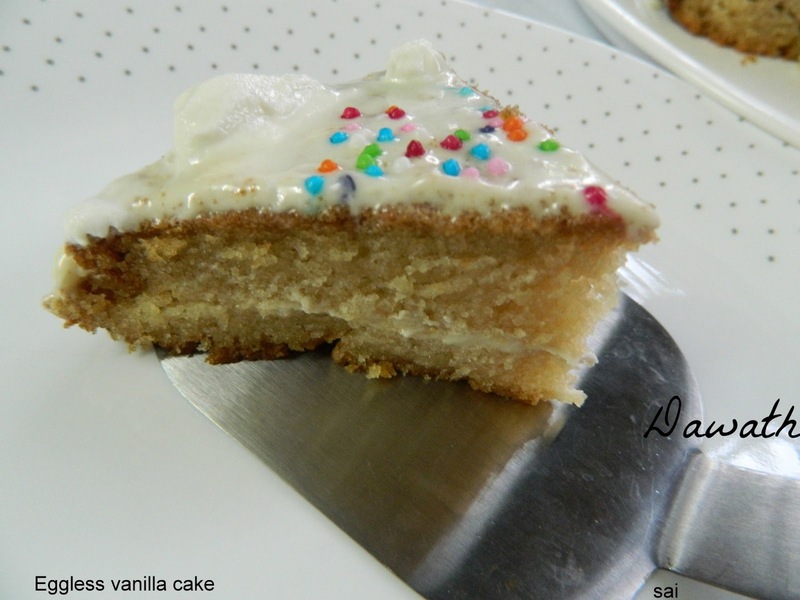 Please try this angelic beauty dear cake lovers. Preheat the oven for 15 minutes at 180 deg C.
Mix sugar and curds together until smooth. Add in the baking powder and baking soda and mix it,the mixture will be frothy and leave it for 2 minutes. Add oil and essence and mix it,add flour little by little and beat it until smooth. Grease an 8″ round pan with ghee or butter ,arrange butter paper and pour the batter. Bake it for 30-35 minutes or until done. Prick a bamboo skewer or toothpick at the centre of the cake ,if it comes out clean without any batter stuck to it,the cake is perfectly baked. 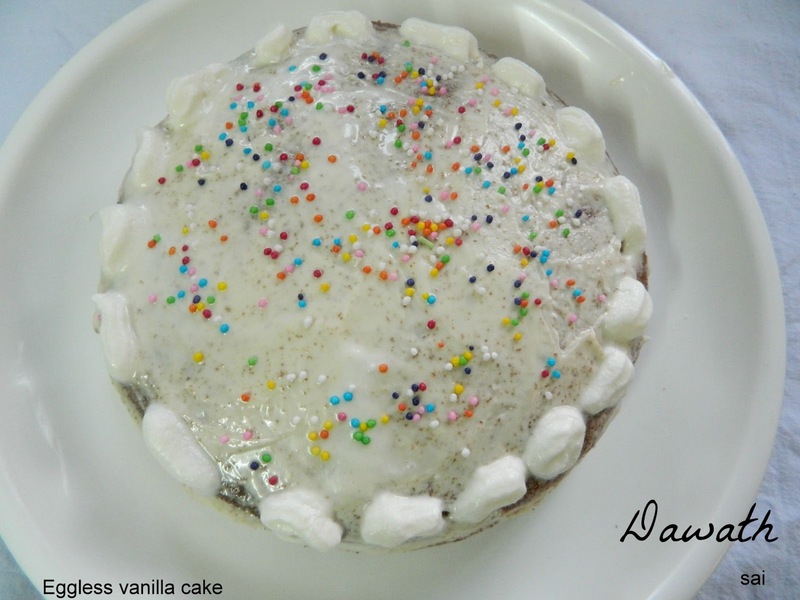 Cool the cake for sometime and flip the cake out from the tin and cool it on a rack. Cool the cake completely before you frost or do icing. 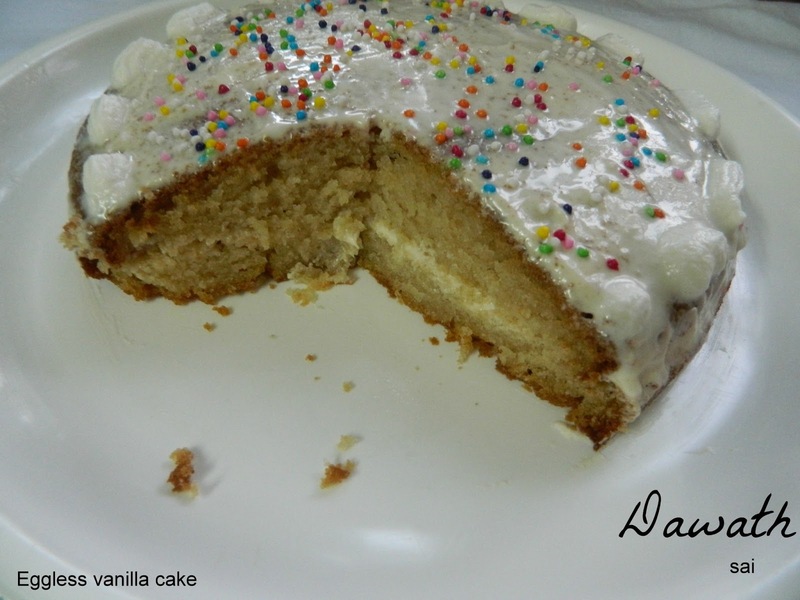 Use a serrated knife and cut the cake into half horizontally. Place top of the cake facing down,onto your serving platter. Cover it with the second piece of the cake just like a sandwich. Apply the icing on the top and all over. I applied a thin layer that is only the crumb coat since we do not like too much sweet at our place. But it would be better to apply 2 to 3 layers,after applying first set leave it to set for sometime and then apply the second coat always. 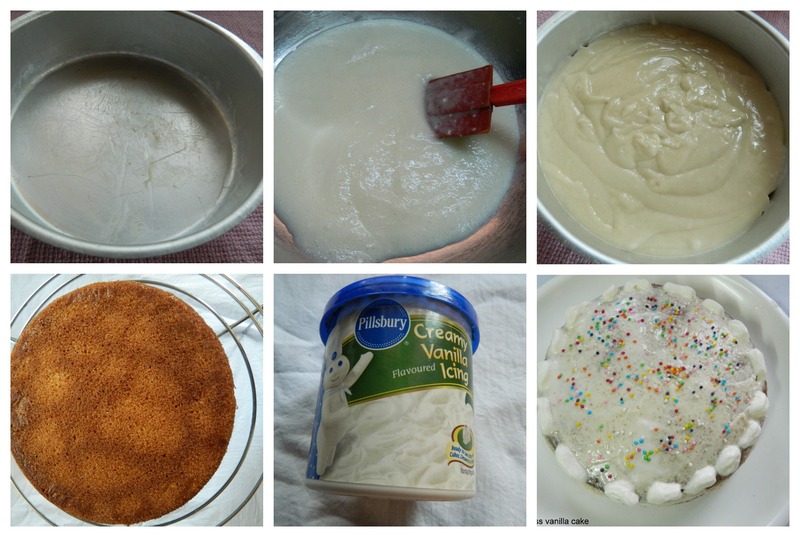 You may also refrigerate the cake after the first set of icing for sometime before applying the second coat. I used a readymade fresh cream spray to swirl on the top of the cake but it slightly melted by the time I shot pictures,so not a clean job. Sprinkle some sugar dots on the icing. You may also do frosting of your choice or enjoy just like that. It is better to line the bottom of the baking tin with the butterpaper for the clean finish.